These two posters show the difference between probability and chance. The chance poster includes a percent symbol and a number line to show how certain, likely, unlikely, and impossible an event is based on the percent of it happening. 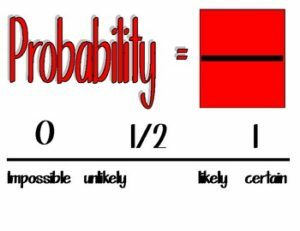 The probability poster includes a fraction symbol and a number line to show how certain, likely, unlikely, and impossible an event is based on the percent of it happening.